We’re seeing a seismic shift in the way travel businesses are managed, as companies adapt and embrace modern technology to expand their global reach. One such change is the willingness to depart from the traditional nine to five office-based routine and embrace the idea of employing homeworkers. It’s an unorthodox method, but one that is proving popular both with employers and their staff. One of the greatest attractions for employing homeworkers is the amount of money a travel business could save in doing so. If your company is expanding at a rate where the staff count is outgrowing your existing office, employing homeworkers could prevent the need and expense of moving to a new space. Similarly, if your business prefers to offer an out-of-hours service, homeworkers can help to do this without the concern of running an office space 24 hours a day. Employing remote staff can also be beneficial when an entire office might be affected by an unavoidable crisis such as power outage or severe weather condition. Homeworkers are able to continue to work uninterrupted. Recent evidence suggests that homeworkers are also more productive than their office-based counterparts, a report conducted and issued by the Canada Life Group revealed that homeworkers ranked their productivity at 7.7 out of ten, compared to 6.5. One of the reasons for this could be the removal of distractions associated with working in a busy office environment, making it easier for employees to focus on their work. The same Canada Life Group study also found that home-based workers were less likely to take sick days and would use remote technology to continue with their work even when unwell. Office workers were found to take 3.1 days sick leave annually, whilst homeworkers instead only took 1.8 days. A further study conducted by the University of Texas found that one of the many rewards companies might reap when employing homeworkers, was an increased weekly working time of five to seven hours per employee. Employees working remotely are more likely to continue until a task is finished rather than clocking off at a set time, as office-based workers might. Employing homeworkers can however present its own set of challenges. Travel businesses must ensure that the candidate they’re looking to hire has the correct office space or environment to work from and that they don’t have other distractions that will keep them from the task at hand. It is also important to ensure remote employees are made to feel as though they’re part of the team and be mindful that they have the appropriate support when needed. Travel companies must trust their remote employees until they are given a reason to doubt otherwise. It can feel like a leap of faith, but the system will only work if the homeworker is trusted to perform the role to their best ability. 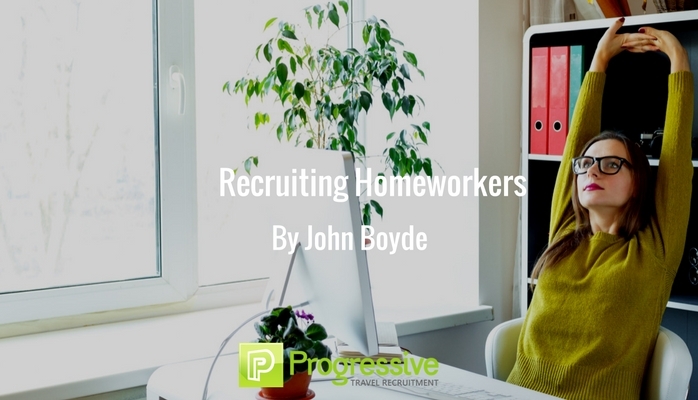 To try and mitigate against these challenges, it is important to look for certain characteristics in candidates applying for homeworking roles. They should be self-motivated and driven, show great initiative, be able to problem-solve alone and should have a track-record of being an achiever and hitting targets. They should also be able to confidently make quick decisions on behalf of their company, so will need strong experience in the field they are being hired for. Employing homeworkers for a travel role could reap huge benefits for your travel company. If you already have already employed remote workers or are considering it, I would love to hear from you. Connect with me on LinkedIn or contact me with your views. Or perhaps you have a homeworking role for which you’d like assistance. Submit your homeworking vacancy here.